It has been said that “a man is known by the company he keeps.” And Larry Dean Milligan (September 23, 1946 – July 14, 2011) kept excellent company — from his dear friends who are lawyers, business people and advocates, to the homeless men, women and children whom he befriended and championed, to his partner, Johanna Argoud, and their family whom he loved with all his heart. For over 20 years, Larry worked tirelessly with Johanna and wonderful colleagues in San Diego to help homeless people in many ways, including giving food to satisfy their hunger, fighting for shelter to protect them from the elements and working for public toilets for their personal hygiene and dignity. Larry made his causes visible by making himself visible. He tabled his opinions on the San Diego Concourse. He wrote articles and lobbied policy makers. But perhaps the most influential thing that Larry did was that he sacrificed his own health through hunger strikes to bring awareness about the plight of homeless people. He thought that homelessness should not be criminalized. To this end, he fought the imposition of illegal lodging tickets upon homeless people who were sleeping on public sidewalks in the City of San Diego because there was not enough space in the local homeless shelters. In 2004, largely through Larry’s efforts, the lawsuit, Spencer v. San Diego, was filed to protect homeless people from illegal lodging tickets. 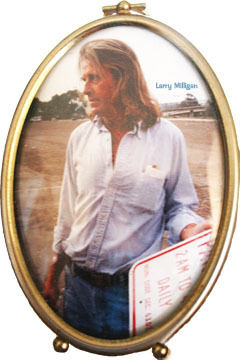 Larry was victorious when this lawsuit was settled in 2006 and homeless people were allowed to sleep outside on public areas in the City of San Diego from 9pm to 5:30 am without being ticketed by the police. He felt that the November 2010 modification to this settlement was unfortunate because under this modified settlement the police are allowed to ticket a homeless person who is sleeping outside in the City of San Diego if there is an available shelter bed; if the police offer the homeless person the bed; and if the homeless person refuses the bed. Larry took great pains to avoid confronting people. He used temperance, kindness and truth to bring about peaceful change. He was a true humanitarian. And now a few words from some of the members of the excellent company that Larry kept. Not only will Larry be remembered for the excellent company he kept, but by the passion and devotion he exhibited as an outstanding leader, as an effective advocate for homeless people and as a genuine human being. This entry was posted in Uncategorized and tagged Hoffmaster v. San Diego, Homeless Community, Homeless People, Homelessness, Impact News, Larry Milligan, Leaders Homeless Empowerment, Spencer v. San Diego. Bookmark the permalink.